Order your Sailor 1911 Large North American Exclusive Fountain Pen today from FahrneysPens.com. Fine Pens, Refills & Luxurious Gifts – great prices & fast shipping. Sailor’s family of North American exclusives keeps expanding! The arrival of the new Sailor 1911 Key Lime is a tribute to exotic places and everyone’s favorite warm weather pie! The Key Lime is a vibrant green with a slight metallic sheen, accented with rhodium-plated clip, trim and solid gold nib. The Japanese-made Sailor 1911 fountain pen is sought after by those in the know for its superb, flexible nib designed by Mr. Nagahara, the master nib maker at Sailor. The 1911L fountain pen has a bold, commanding barrel size and a responsive nib crafted in 21K gold. Both models offer nibs in seven point sizes: XF, F, MF, M, B, MUSIC and ZOOM. You can also enjoy the other Sailor U.S. Exclusive colors – Tangerine Orange, Fresca Blue and Anchor Gray. 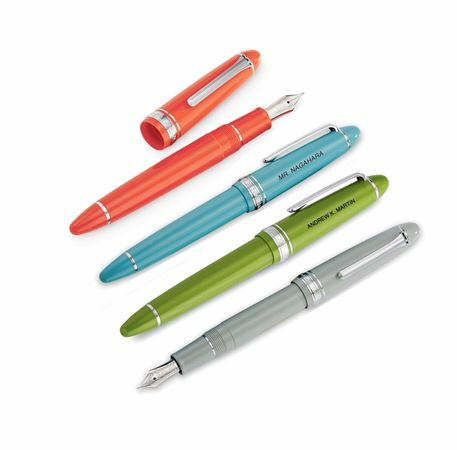 Enjoy the outstanding performance of Japanese-made Sailor fountain pens in exclusive colors available only in North America! Cartridge/converter fill. I've been looking for this pen for 30 years. It was worth the wait.